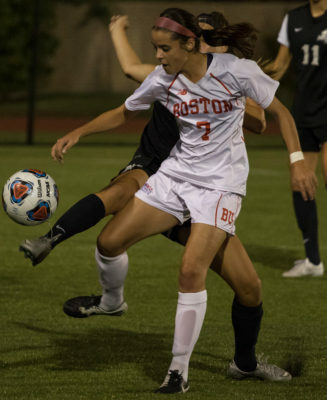 The BU women’s soccer team is hoping to avoid an all-too-similar start to their season. The Terriers (1-3-2) began last season 0-10 before capturing their first victory of the season. Coming off of a road trip in which BU tied both Arizona and Arizona State, head coach Nancy Feldman and her squad are looking to get that needed boost to secure early-season victories. Feldman also hinted that the team needs to put themselves in the best position to win games. So far this season, the Terriers have been outscored by their opponents nine to six, a sign that their offense needs play with extra motivation. No player has scored multiple goals, thus far, as all six goals this season have come from different players, with senior forward Christina Wakefield leading the team with three points. In goal, BU has been paced by senior Hannah Ciolek who has allowed 1.43 goals per game. Last season, Ciolek found herself splitting time with then-senior Bridget Conway. But, with Conway graduating, Ciolek finds herself playing all 90 minutes, something she is adjusting well too. Feldman also commented on the development of Ciolek from last season to now. In the team’s next game, BU will host Marquette. Marquette (5-1) comes in winners of five straight games, as well as holding its last four opponents scoreless. BU’s struggling offense will need to get creative to break down the Golden Eagles’ defense. Marquette is led offensively by junior forward Carrie Madden, and graduate forward Darian Powell. Madden and Powell have both tallied seven points this season for an offense that has averaged 1.67 goals per game. BC features a balanced attack, with four players totaling over seven points each. The offense is led by sophomore forward Jenna Bike, freshman forward Sam Coffey, redshirt senior midfielder Lauren Berman and sophomore forward Olivia Vaughn. Despite the different styles of play Feldman’s team might see this weekend, she will not change her the way her team prepares.